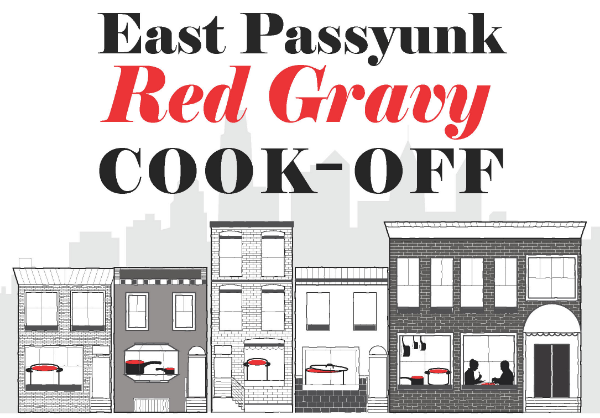 Ten homemade gravies (that’s red sauce, to you) from South Philly home cooks will be available for tasting at the East Passyunk Crossing Civic Association’s fifth annual Red Gravy Cook-off. The tasting, followed by a pasta dinner, takes place this Sunday, March 31st, 2019, from 4-6 p.m. at Ss. Neumann-Goretti High School, 1736 South 10th Street. A $20 ticket gets you entry to this popular local event celebrating the Italian-American heritage of the neighborhood. 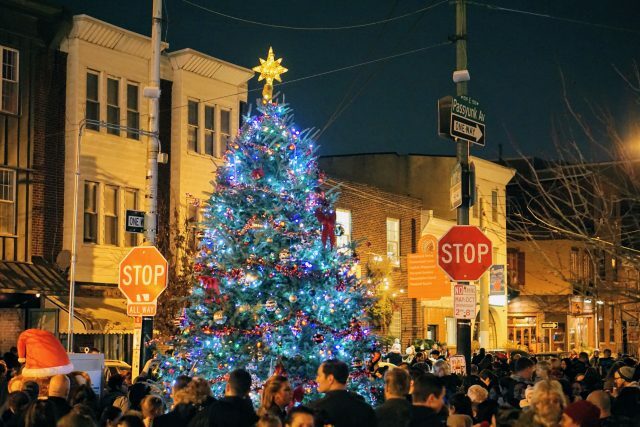 On Thursday, November 29 from 5 to 7 p.m. the East Passyunk Avenue Business Improvement District (EPABID) and Passyunk Avenue Revitalization Corporation (PARC) will host the annual tree lighting party at the Singing Fountain, Tasker St. and East Passyunk Avenue. The event is free and families are welcome. The celebration will include live music, carolers, holiday treats from Avenue businesses, shopping, and a visit from Santa Claus. The 2017 tree at the Singing Fountain. Photo courtesy East Passyunk BID. After the party, revelers can strut down the Avenue with the Pennsport String Band for extended shopping hours as the Deck the Ave campaign kicks off with shopping, sales, and other festivities which will run through December. According to Bryan Fenstermaker, executive director of PARC, this year’s tree will be a 16-foot Frasier Fir born-and-raised in North Carolina. Urban Jungle at 1526 East Passyunk will deliver the tree on November 21. PARC hires John McClenny of Yes Dear! to install the lights and decorations in the days leading up to the event. You can donate $10 to the CBS 3 and CW 57 Philly Toy Fest toy drive by texting JOY to 41444. EPABID and PARC would also like to thank their sponsor, Univest. Say goodbye to this sad view. 6th and McClellan looking northwest. Google Maps. The September 12th meeting of the East Passyunk Crossing Civic Association’s Zoning Committee was more crowded than usual. Neighbors overflowed the available seating at the East Passyunk Community Center. 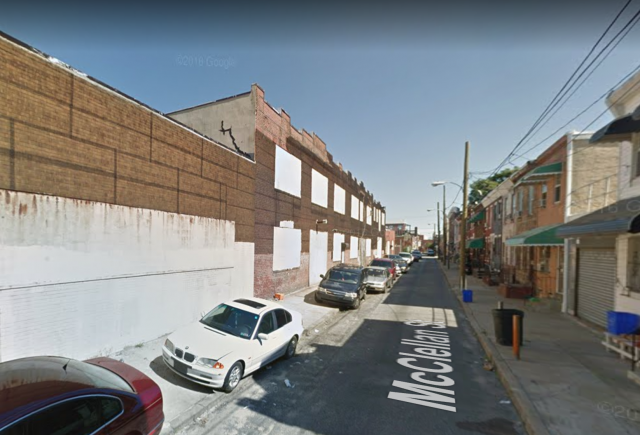 Although another property was discussed, most were there to see the presentation about the redevelopment of the north side of the 600 block of McClellan Street. 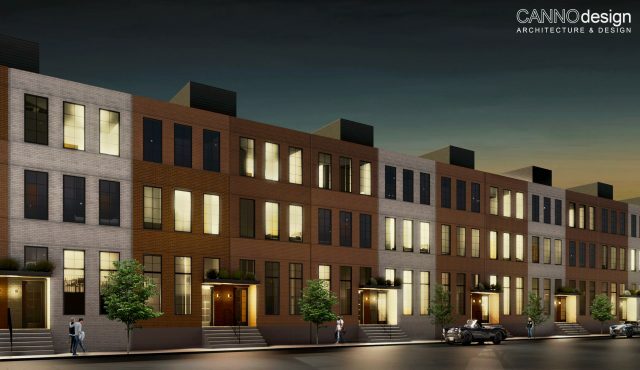 …and say hello to these handsome townhomes. CANNODesign. 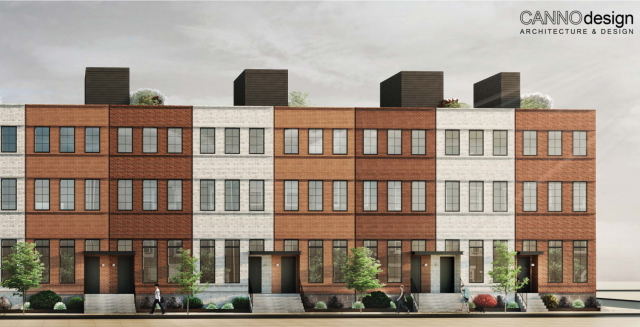 This much-anticipated project proposes to replace the cabinet warehouse currently located along the north side of the 600 block of Moore Street to allow for the construction of 25 single-family townhouses. Developer Kumas Homes also has plans to build multi-family units on Moore Street, but this presentation focused expressly on the McClellan Street section of the property. View of the warehouse on the south side of the 600 block of McClellan, looking east. Google Maps. Future view. Provided by CANNOdesign. Designs by CANNOdesign show running-bond brick facades with metal canopies over the entry doors. Aluminum-sided pilot houses allow access to roof decks with metal railings. The facades alternate from light gray/tan to darker red brick. View of parking details. Note “Future Development” site along Moore Street. CANNOdesign. The project requires zoning variances since the developer hopes to create one lot rather than 25 separate parcels, in part to provide the parking in the rear. Owners of these row homes will be part of a homeowners association which will maintain the parking area. A variance is also required since the parking spaces eliminate the required rear yard. The developer stressed their good-faith efforts to listen and respond to the community since, ‘by-right’ they could make a number of different design choices. One concession to neighbors is the recent removal of towing signs to free-up parking on the block. Although some disagreed with the very nature of the development, many neighbors expressed support for the project. In response to the desire for more greening, the properties will feature green roofs, as well as planting spaces in the front of the buildings. 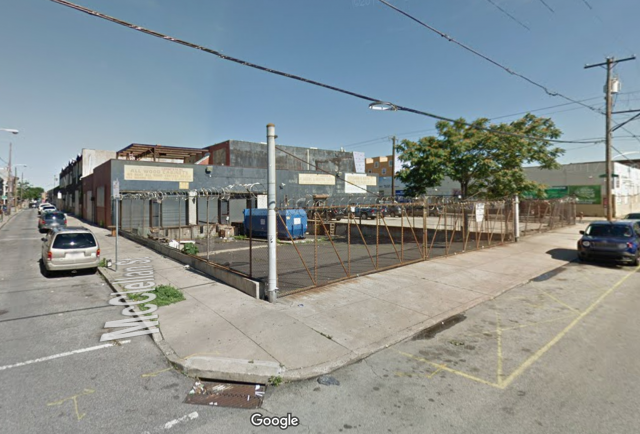 Developers also agreed to donate land on the 700 block of Emily Street to preserve a community garden used by residents of the area’s Burmese and Bhutanese community. “Language Labs” mural on the 7th Street facade of the building. Many neighbors voiced sadness at the potential loss of the “Language Labs” mural by artist Shira Walinksky. Located on the 7th Street side of the property, the colorful mural was completed in 2015 as part of the Southeast by Southeast project. The developer is in discussion with Mural Arts about possibilities of preserving the public art, or creating another work at the site. A view of the building from 7th and McClellan, looking east, before the mural was completed in 2015. Google Maps. Practical concerns about debris remediation during demolition were addressed, as well as the potential impact on SEPTA’s 47 bus route. Although support for the project among attendees was mixed, a majority of those present voted in favor of the project. The EPX Civic Zoning Committee board also voted in favor of the project. If approved by the Zoning Board of Adjustment (ZBA), the developers hope to start work in three to six months. 20-days notice will be provided to neighbors before demolition begins. This project will go before the ZBA on Wednesday, September 19th between 2pm and 5pm. Zoning hearings are open to the public to advocate for or against the project. ZBA meetings are held on the 18th floor of 1515 Arch Street. 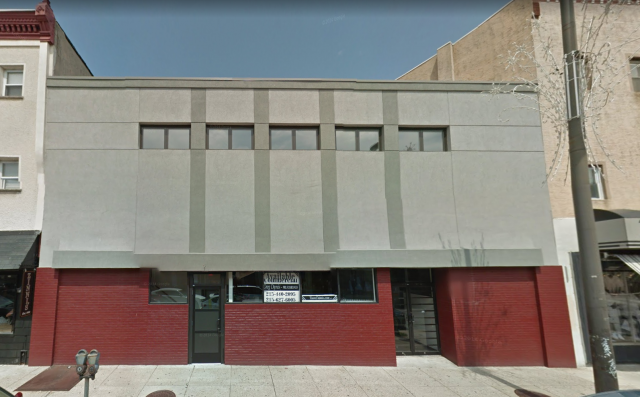 EPX Zoning Meetings are held on the second Wednesday of the month at the East Passyunk Community Center, 1025 Mifflin Street. 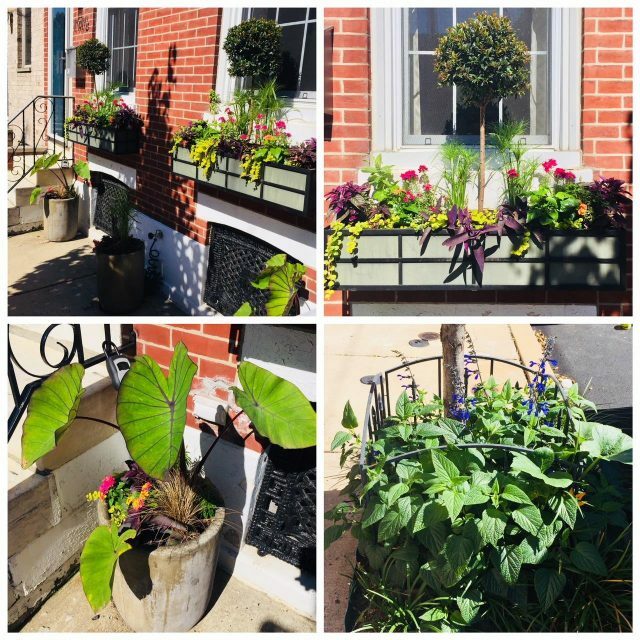 It’s gardening season in South Philadelphia, and the East Passyunk Crossing Civic Association (EPX) is hoping to get residents to think “beyond the backyard.” Their annual EPX in Bloom competition encourages residents to beautify their front steps, sidewalks, and window boxes. 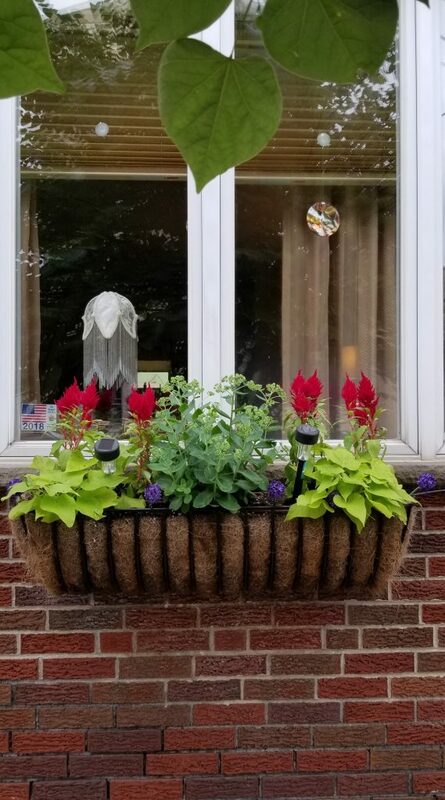 Neighbors are invited to submit images of their front greenery and plantings, with the possibility of winning prizes for Judge’s Choice or Crowd Favorite. You can help EPX determine the Crowd Favorite by ‘liking’ your favorite images on the Civic’s Facebook page. Entry from 1916 S 11th Street. See more at the EPX Facebook page. The event is spearheaded by the EPX Beautification Committee, whose goal is to ‘clean and green’ within civic’s boundaries, Tasker to Snyder, 6th to Broad Street. 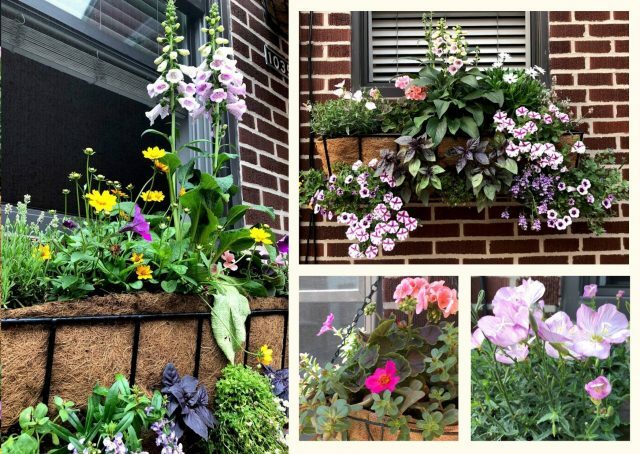 Entrants will be featured on a walking tour map, so neighbors can see the blooms even after the competition’s June 30th end. Entry from 1035 Emily Street. See more at the EPX Facebook page. Voting is currently open via the EPX Facebook page: https://www.facebook.com/EastPassyunkCrossingCivic. You do not need to be an EPX resident to vote, and you may vote for multiple entrants. Due to a technical error, entries from EPX residents are still being accepted, if you live within the civic’s boundaries, 6th Street to Broad Street, Snyder Ave to Tasker Street. To enter, email an image of your front display to david@epcrossing.org and complete the application available on EPX’s Facebook page or at www.epcrossing.org. The competition’s guidelines are available here. Entry from 2017 S. 11th Street. See more at the EPX Facebook page. 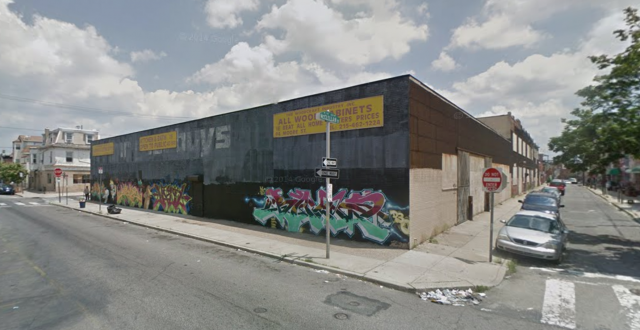 Photo of 1804 E Passyunk Ave. captured by Google Street View before the trees were added out front. 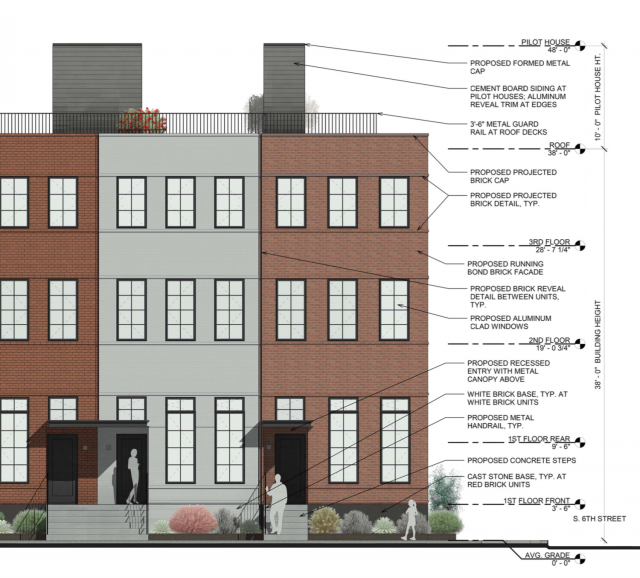 The changes to the building required a zoning variance and were vetted at a public meeting of the East Passyunk Crossing Civic Association zoning committee on January 11, 2017. Plans call for the addition of a third floor to create three dwelling units above the first-floor retail space. Roof decks (more akin to balconies) would be added to the back of the building above the 1st, 2nd and 3rd floors. The top floor deck is initially permitted for maintenance purposes only. The presenter, Ron Patterson, attorney for the owner, said the third floor facade will feature “a metal panel with wood slats. Lighting and a small canopy will accentuate the residential entrance.” The plans were approved by the community and EPX zoning committee. At the time the plans were presented, Escape the 1980s, which obtained an “assembly and entertainment” permit in 2016, was to remain as the tenant. According to their website, the business now hopes to relocate and add an Escape the 1990s room as well. 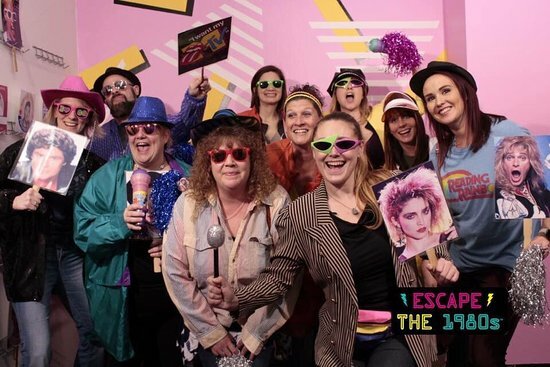 Escape the 1980s is an interactive game where 2-12 players figure out clues and codes to unlock doors and get through an 80s themed adventure. 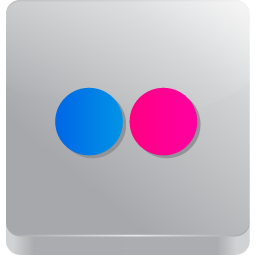 The award-winning game, conceived by Steel Owl Productions, was built in the summer of 2015 by Philly artists, programmers and engineers. 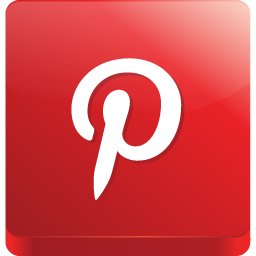 It’s been featured in dozens of publications including USA Today and The Philadelphia Inquirer. If you’d like to check it out before June 30th, go here. As Sunday’s 4th Annual East Passyunk Red Gravy Cook-off commenced at Ss. Neumann-Goretti High School, attendees heard the pleasant strains of Dean Martin’s “That’s Amore.” It was a fitting tune considering that a love for pasta’s pal – red gravy – had brought a crowd of 200 guests together. The cook-off began with guests sampling 15 gravies, and ended with an unprecedented voting decision. As the crowd grew, Samantha Gross, who organized the event for the East Passyunk Crossing Civic Association, kept busy trying to find more plates and cups to accommodate the throngs. “We experienced a problem that every event planner dreams of – we had a much bigger turn-out than last year – nearly 80 more. Luckily, we had amazing resources to pull everything off, and, in the end, everybody got sauced,” she said with a laugh.